On this day in 1185, the cave monastery of Vardzia, on the slopes of the Erusheti Mountain in Southern Georgia, was consecrated by Queen Tamar of Georgia. Building on the site, about 19 tiers high, had started a couple of years earlier, but excavation shows that people had been living there since the Bronze Age. Tamar was a warrior queen and dedicated the site to the Virgin Mary after successes against the Muslim invader. Because of its height and its construction in the rock, the site was held to be as impregnable “as the wall of Alexander the Great”, as the Persian Hasan Bey Rumlu described it. However, this proved not to be the case and it was taken, and sacked, by the Persian Shah Tahmasp I in 1551. The Ottomans arrived in 1578, the monks left and the site was abandoned. Today, it is visited by people eager to see the construction itself – 242 rooms and a church in the western site; 165 rooms, including six chapel, in the eastern – and its famous wall paintings. It is a candidate for inclusion on Unescso’s World Heritage List. The story of modern Europe since the Wall came down, Since Otar Left is about a family torn about by economics and is about migrant workers and the families they leave behind. Though the story is familiar, it’s unlikely you’ll have seen it told as well as it is here, the acting at such a level that we’re entirely engaged with the three women Otar has left behind – the grandmother Eka (Esther Gorintin), the mother Marina (Nino Khomassouridze) and her eye-magnet daughter Ada (Dinara Droukarova). Otar is Eka’s son, a doctor who went to Paris to make money working on a construction site. Since Otar left, the relationship with him has been the odd snatched phone call on telephones that don’t work so well since the communists lost power (says Eka), as well as the sum of money he regularly sends back. And then, as often happens to migrant construction workers, Otar dies. Marina is worried that it will kill her mother if she finds out. And so the two women decide to keep the truth from Eka, in a plot development that feels as if the film is going to head into the comic territory of Good Bye Lenin! It doesn’t, though. Instead director Bertuccelli and her gifted trio of actors spin a teasing story of two younger women holding out against the older woman, and then the older woman finding out anyway, because she’s been alive longer and has more guile. Which leads to Eka deciding, once and for all, to settle the increasingly dubious fact of Otar’s existence and heading off to Paris, a place she hasn’t visited since the Second World War. Bertuccelli has a history as a documentary maker, and also did time as an assistant to Kieslowski, Iosseliani and Tavernier, so you might expect her feature debut to be intelligent, focused and well crafted. But this beautiful? – the shots of Tbilisi could be hoovered up and re-used by a grateful tourist office. This well acted? 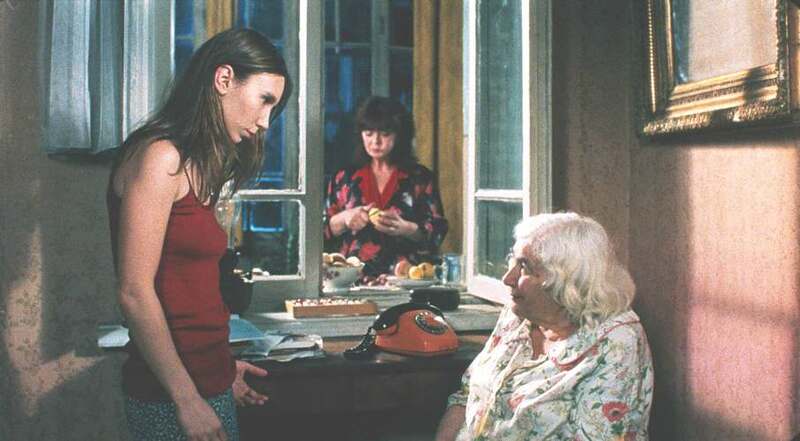 – Gorintin is a total find (she was 90 when this was made and had only made her acting debut five years earlier), though all three actresses are remarkable in their interplay, as if they had known each other for decades. There’s a documentary-maker’s eye, too, for their surroundings – the book-packed apartment they share, crammed with the belongings of women from three different generations – and Bertuccelli constantly stays away from the close-up. The film is about the women being in their environment and of their environment. So what of Otar? Not much, to be honest. He’s the Macguffin that drives this beautifully observed character piece whose perfection would be complete if it stopped at the point where it is revealed that the old lady has trumped the other two. Or perhaps that would be too Hollywood.